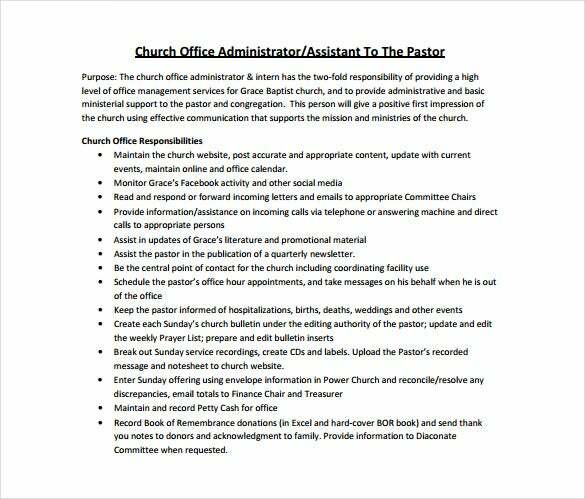 Office administrators undertake a wide range of activities beginning with supervision and coordination of the functions of their staff to ensure smooth operation of the organization. Under management of their human resources, these workers interview job applicants and carry out their orientation programs. They also determine leave privileges, administer salaries, train and develop staff and assess them before granting anyone promotion. 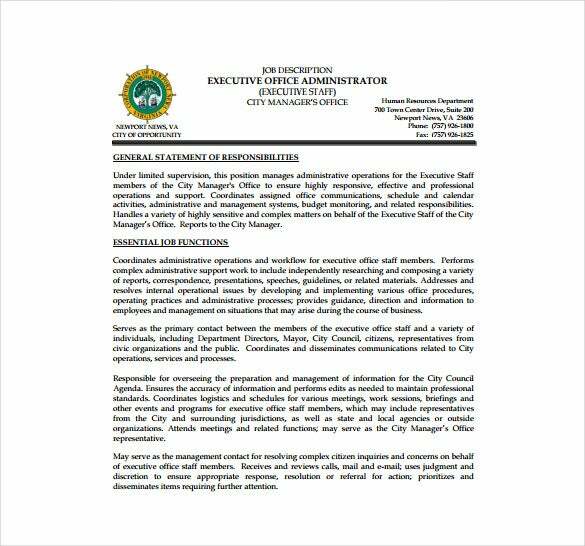 You may like Office Manager Job Description Templates. They cannot run away from managing budgets, records, facilities, accommodation and an organization’s resources because it is their role to maintain the business. They project their expenditures on an annual basis in order to maintain their budgetary control and inventory measures. You may also like Job Description Templates. 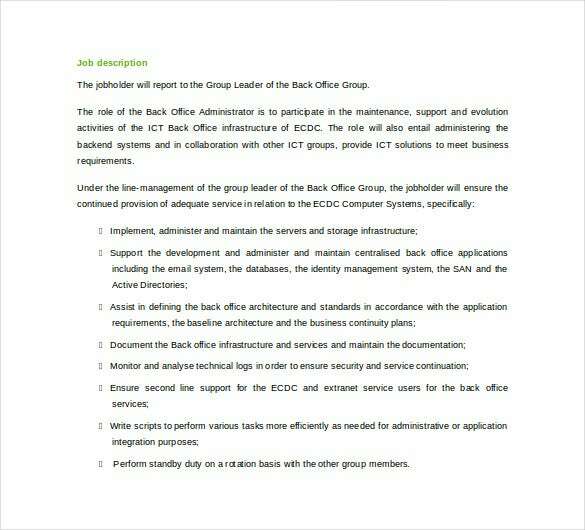 uk-cpi.com This is one of the simplest forms of office administrator job description template which you can easily download and print in the PDF file format. 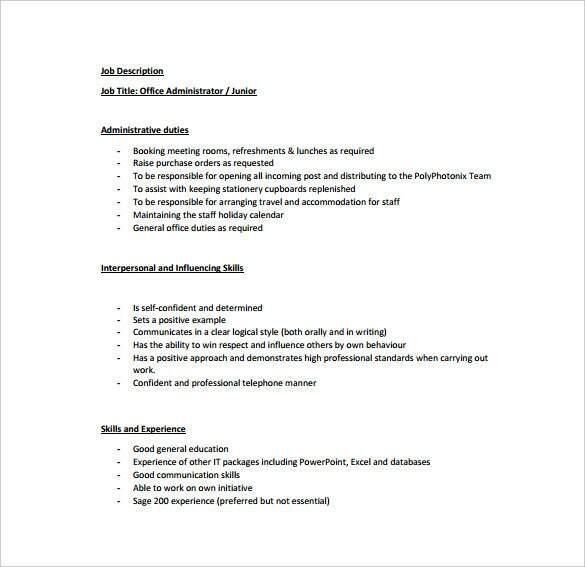 Any organization looking to hire office administrators for their office work can use this template and post their job requirement according to their set of criteria. ecdc.europa.eu This useful template is available in the Microsoft Word Document Format and as such you can also convert it into a PDF file. Back office jobs are very crucial and almost every organization needs efficient back offices executives to perform various types of tasks. 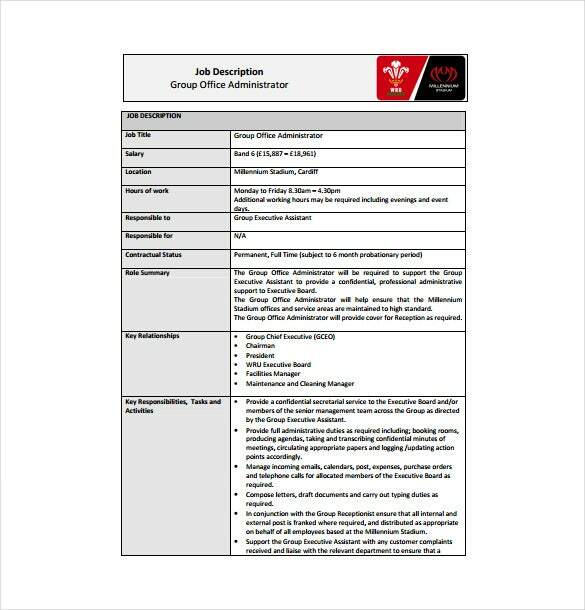 This template will give you an idea when posting the job requirement for the post. 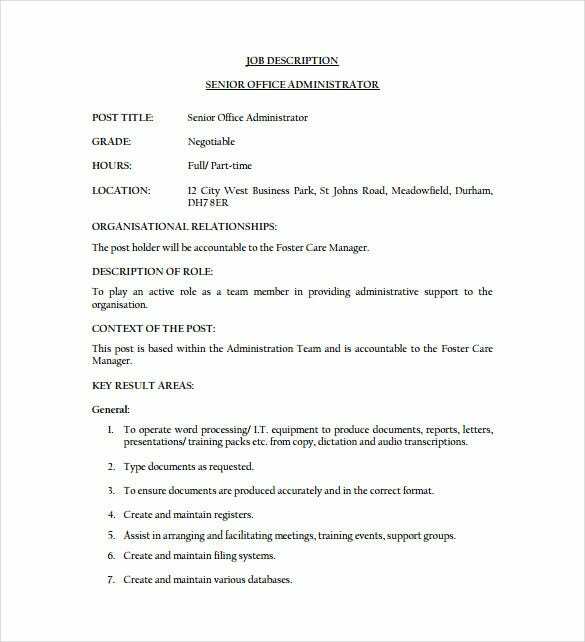 orchardcare.org When needing to hire a senior office administrator who is quite responsible and carry out all kinds of duties proficiently, The PDF file format of the template describes the role of the job in detail including job location, working hours, content of the post and the key areas where the candidate is required to focus on. 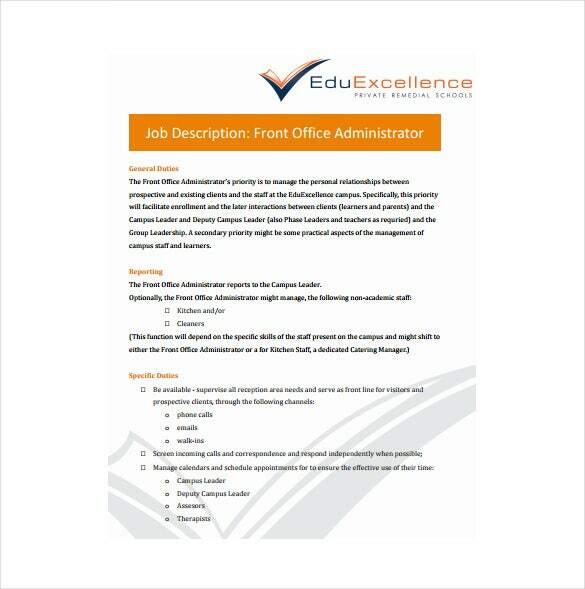 eduexcellence.co.za The role of front office executives is as important as the back office professionals. 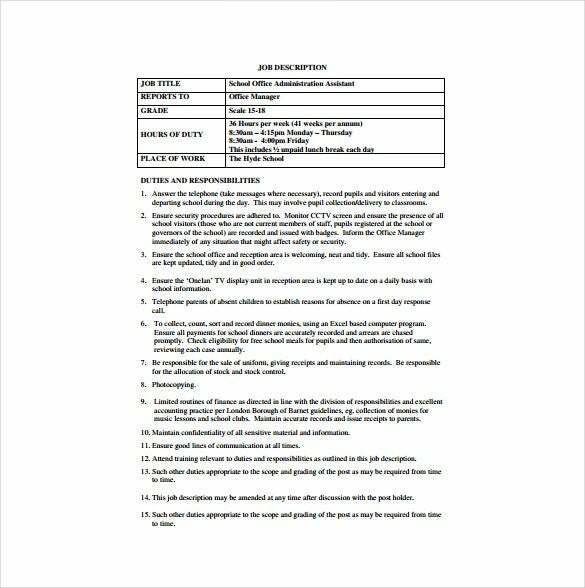 Therefore, if you are planning to hire some professional for the job the front office job description template in PDF format will help to post a perfect job requirement notification so as to choose the best candidates. You are already quite aware that the job administrator performs one of the most important duties that carry a lot of responsibilities and skills. These are different kinds of templates which have been specifically designed for various kinds of job requirements. As a recruiter, you have to download the templates and go through its content or the prerequisites of the given post. If you want you can also add some additional information for the candidates applying for the post such as the salary constraint, various types of allowances or incentives. Thus, you can select the desired candidate without any hassles whatsoever. 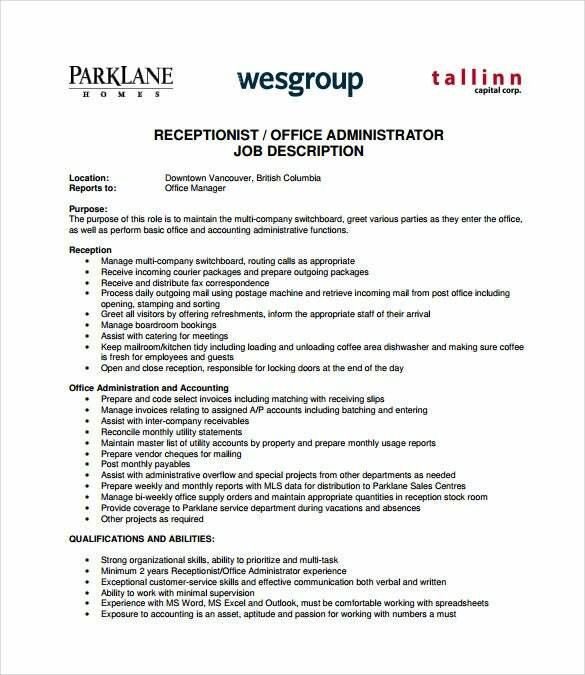 It wouldn’t be wrong to comment that these Office Administrator Job Description Templates are tailor-made for both the recruiters as well as the aspiring candidates looking for lucrative job opportunities. The Human Resource Department of the organization does not have to prepare the draft or the format of the job. All the key factors required to apply for the post are provided in the sample format. On the other hand, individuals applying for the post are well aware of what the specific job responsibilities for their preferred post are. They prepare their Curriculum Vitae or resumes accordingly to impress the recruiters. • The templates help a great deal in hiring the best candidates suitable for the said post. You can find all the vital information regarding the job in the templates only. • The candidates being aware of job responsibilities in advance can prepare themselves to avail that post • Since you hire the best candidate it helps in the smooth operation of the organization • These templates are available in various formats such as the Word Doc or the PDF file. You can choose any of these to download for free. • These are editable and printable. You can edit the content as per your requirement of the job description. 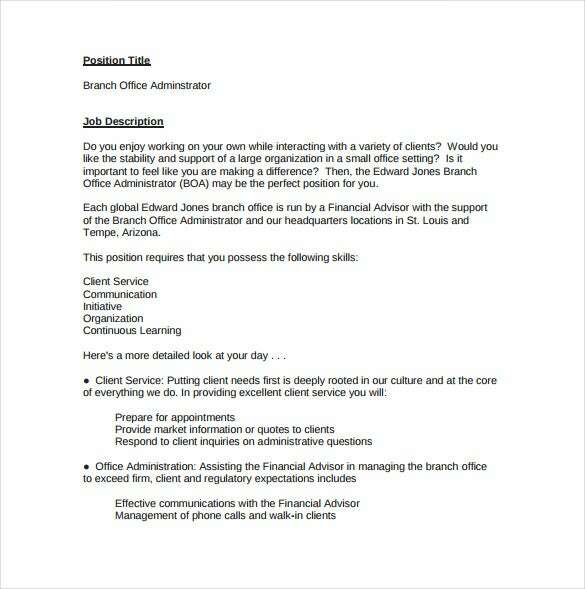 These Office Administrator Job Description Templates can reduce your work load when you are planning to hire candidates for any job. As such you don’t have to think much about adding all the essential points before releasing the notification. These templates are helpful to all kinds of organizations involved in various fields of business.